At the crossroads of Europe, Asia, and the Middle East, Turkey has long been a hub for trading. It was an important destination of the camel caravans that traveled the Silk Road and brought exotic goods and spices westward. Visit Istanbul's spice bazaar and you'll see why Turkey is famous for its spices. Stacks and stacks of freshly ground spices line the aisles of this historic bazaar and wow visitors with their aromas and colors. But you don't have to be in Istanbul to enjoy the best spices. Fresh spices are found everywhere from the local bazaars and markets to the largest supermarkets. In fact, most spices used in Turkish cuisine are easy to find wherever you are. Just look in the spice section of your favorite market. More exotic spices like nigella seeds and sumac powder can be found at Turkish, Greek, and Mediterranean grocers. Here are the ten most popular spices used in Turkish cooking. 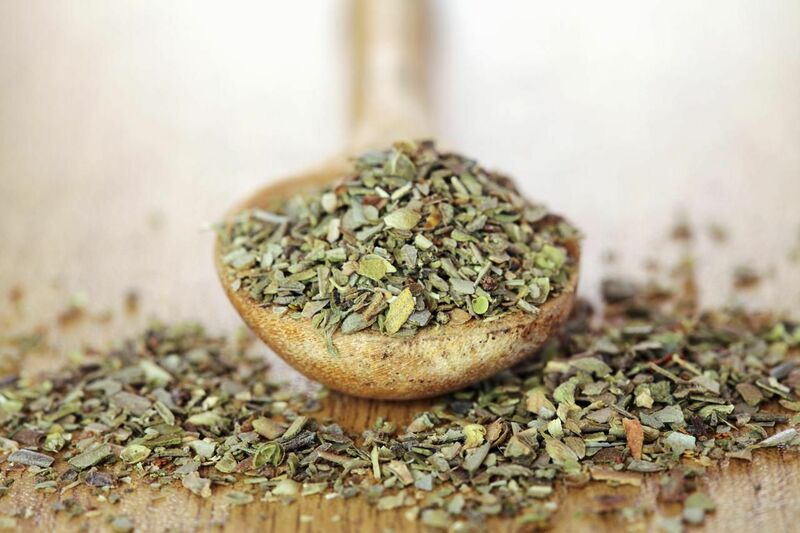 Oregano, or 'kekik' (keh-KEEK'), is found all over the country and is very popular in the Aegean and Southeast regions. Dried oregano is most commonly used to season meat and poultry dishes, salads and soups. 'Oregano water' is made with steeped oregano leaves and is said to calm the stomach and aid in weight loss. Olive oil is infused with fresh oregano and used on salads and more recently for dipping bread. Abundant in the southeast, fiery red pepper flakes, or 'pül biberi' (POOL bee-BEYR'-ee), is sprinkled on just about everything as a garnish for those who like it hot. It's a key ingredient in most spicy dishes, especially meat dishes and soups. It's often kneaded right into the ground beef mixture when making spicy versions of 'köfte' (koof-TH'), or grilled meatballs. Mint, or 'nane' (NAH'- neh), is used fresh and dried in many salad recipes as well as with meat, poultry, and fish. It's also an important ingredient in 'Ezogelin' (ez-oh-gel-EEN') soup and popular as a garnish to sprinkle on 'mant?' (mahn-TUH'), a classic Turkish dumpling similar to miniature ravioli. Allspice, or 'yenibahar' (yen-EE' bah-HAR"), is a key seasoning kneaded into ground beef to make 'Lady's Thigh' meatballs, or 'kadın budu köfte (kah-dun BOO'-DOO' kuf-TEH'). It is also used in many versions of fragrant rice filling for stuffed vine leaves and other stuffed and wrapped dishes. Cinnamon is a favorite on the sweeter side of Turkish cuisine. It's available in stick and powder form and used in desserts, puddings, cakes and fruit-filled cookies and pastries. It's also delicious sprinkled on 'salep' (SAH'-lep), a sweet, hot milk consumed like hot chocolate. Cumin, or "kimyon" (keem-YOHN'), is used to season meat dishes, especially ground beef, in 'sarma' dishes like stuffed collard greens, swiss chard, and grilled meatballs. It's also used to season soups and sprinkled over meats and stews as a garnish. Not to be confused with ​poison sumac found in North America, sumac is a common spice in the Mediterranean and the Middle East. When ground into powder form it has a lovely burgundy hue and gives foods a slightly tangy, lemony flavor. In Turkish cuisine, sumac powder is used mainly as a garnish. It is sprinkled on grilled meats, dumplings with yogurt, and mixed with onions to accompany sauteed calf liver. Not really a spice, but a seed, sesame seeds are used to make tahini or sesame paste, and coat the tops of many varieties of bread and pastries. The famous Turkish bread ring called the 'simit' (sih-MIHT'), is covered with sesame seeds and baked to crunchy perfection. Turkish sweet red pepper powder, or paprika, is some of the finest in the world. In Turkish cuisine, it's used in many types of meat, poultry, and bean dishes to add color and flavor without the hotness of its counterparts, hot red pepper flakes, and hot ground pepper powder. It's also used as a garnish for soups, stews, meat, and poultry. Nigella seeds, sometimes called black cumin, is a spicy seed used to sprinkle on top many pastries, rolls and other baked goods such as breakfast 'poğaça (poh-AH'-cha). Each seed has a unique, bitter flavor and their pitch-black color looks lovely on top of just about anything. Black cumin is most often sprinkled on pastries, savories and layered cheese pies made with yufka or phyllo.